Describe the contents of the patient card. Describe what you can customize on the patient card. Add new fields to the patient card. Harryette Randall, the Salesforce admin at Bloomington Caregivers, knows that the care coordinators regularly use the patient card in the Health Cloud console. They consult it for information about a patient’s conditions, prescriptions, appointments, and other details from the patient’s medical records. They also know the patient’s contact information is on the card. Harryette looks over the patient card and finds that it is made up of three components. The Patient Navigation menu (1) lets care coordinators navigate to the pages they need straight from the patient card. Harryette learns she can customize the items that appear in the navigation menu. For example, she can add navigation items to one of the default menu categories, or she can add a category with new child navigation options. 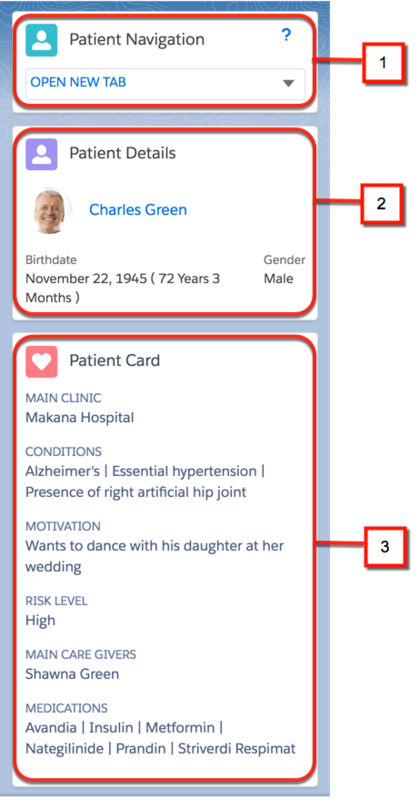 The Patient Details section (2) provides basic identification information about the patient and a thumbnail photo, if one is available. Harryette learns that she can't customize this section. The section labeled Patient Card (3) contains contact and medical record fields. By default, this section shows details such as medical conditions and risk level. Harryette sees that she can customize this list and add fields from the source record system. Leif Hansen, a patient manager at Bloomington Caregivers, wants to see on the patient cards whether his clients have attended the therapy sessions he’s scheduled for them. He would like to see the type of therapy session the patient last attended. Also, even though the session names are usually in English, he wants the Spanish-speaking members of Bloomington Caregivers to see the field labeled in Spanish. The patient contact and medical record fields are where Harryette can add the information Leif wants. She digs deeper and learns about some features and limitations of the card. You can add fields to the Patient Card from any object that is related to the Account object. Each field displays up to 200 characters. After that, users can click Show More to expand the section and view the remaining text. There is no limit to the number of fields you can add to the patient card. However, Salesforce suggests keeping the number to 15, for optimal performance. Where there are multiple records associated with the Account object, such as medications, users can define sort criteria, such as date prescribed, to change the order in which these records appear. Field labels aren’t available for localization using the Translation Workbench. (This is a Salesforce tool that lets you specify languages you want to translate, create translations for customizations you make in your org, and more.) To add a translation, you can add a field in one language—for example, English—and clone the configuration record. Then update the cloned record with the translated text and set the Language field appropriately. The system then displays the label text that matches the user’s language setting. There is one wrinkle to be aware of: You can’t have two records with the same sort order, so you need a different version number for cloned records. For example, if the English record has a sort order of 3, then assign a Spanish version 3.1. To take advantage of the default mechanism that displays fields from an object on the patient card, the object must include a field named HealthCloudGA__IsVisibleOnPatientCard__c. You must set the value of this field to true. It’s possible to use another field as a filter. That field must be a Boolean or a formula field that returns a value of true or false. Also, when adding a standard Salesforce object (such as Case), you must define a custom filter. For the Therapy Session object, Harryette adds a field named HealthCloudGA__IsVisibleOnPatientCard__c and uses a formula to set its value to true for all records. Before she starts working on the change, Harryette looks at this demonstration video on adding essential information to the patient card. Now Harryette is ready to set up things. Here’s how she does it. From the Health Cloud Admin home page, click Patient Card Configuration, then New. Now, the next time Leif checks one of his patient's records, he sees information on the last therapy session the client attended.